The mission of Ballet San Antonio, a professional ballet company, is to share the splendor of dance through diverse artistic performances and outreach programs that reflect, promote and enrich the cultural heritage of our South Texas community. We hold an uncompromising commitment to continually attract and nurture exceptional professional dancers, create distinctive performances, and make dance accessible to the widest possible audiences through partnerships with local organizations. 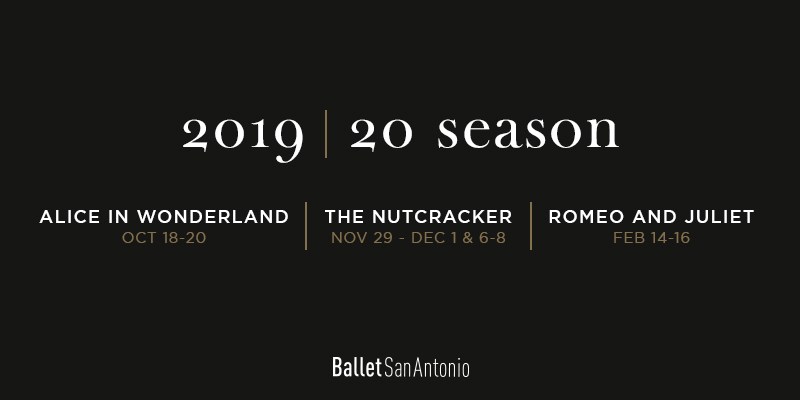 Ballet San Antonio is thrilled to announce its 2019-20 season filled with whimsy, imagination, beauty and love. This season presents the beloved classics, Alice in Wonderlandand and Romeo and Juliet, along with the return of the holiday favorite, The Nutcracker!